When the story begins, the setting is England. Some of the action thereafter takes place at sea in various ships. Once the pirates capture Crusoe, the action moves to Sallee, a port in Morocco. After Crusoe's escape from there, the setting moves to the Canary Islands, until a Portuguese ship arrives. For the next few years, the novel is set in Brazil. Then Crusoe embarks on his ill-fated voyage. After the shipwreck, Crusoe washes ashore on an uninhabited island, where Crusoe spends the next twenty-eight years of his life; most of the novel takes place on the island during these years. After Crusoe is rescued from the island, the setting moves to England, via Lisbon and the land route through Spain and France to Calais. Robinson Crusoe, born in York, is the third son in his family. His parents wish to make a lawyer out of young Crusoe, but Crusoe has other plans. His one great desire is to become a sailor and go to sea. The first foreshadows what lies ahead for the hero. Although his father refuses to give him permission to go to sea, Crusoe runs away to become a sailor. Although almost all of his initial forays into sea life are disastrous, Crusoe is not deterred. During one of his trips, the Moors capture his ship, and Crusoe is taken as a slave. He finally escapes in a boat with another young man. After some interesting adventures, he is rescued by a Portuguese ship. He next lands in Brazil, where his enterprising ways help him to succeed; he becomes a planter and prospers in a few years time. Still not satisfied with his success, he decides to become a slave trader in order to get cheap labor for his plantation. As he travels by boat to find slaves, a storm hits, and his ship is wrecked. All the sailors are drowned except for Crusoe, who is washed ashore on an uninhabited island. The novel is basically about the life and adventures of Crusoe on the island, where he lives for the next twenty-eight years. Crusoe salvages as much as he can from the ship. He builds a home, strong fortifications, plows the land, cultivates corn and rice, and raises goats. His peaceful existence is interrupted when savages land on the island. Crusoe rescues Friday, one of the savages' prisoners, whom he educates and converts to Christianity. When the cannibals visit next, Friday and Crusoe rescue two of their prisoners, a Spaniard and a savage. The savage turns out to be Friday's father. An expedition is sent to the mainland in a canoe to bring back sixteen Spaniards who have been marooned there. An English ship visits the coast, and a few of its crew come ashore in a boat. Crusoe realizes that the visitors are mutineers and that the captain and men loyal to him are being held as prisoners. With good planning, Crusoe and Friday subdue the mutineers and rescue the captain and his crew. When the ship sends another boat with men ashore, they are also tricked and captured by Crusoe's men. Now, all that stands in the way of Crusoe's deliverance is the remaining men on the ship. In a final assault, the ship is captured, and the rebel captain is killed. Soon Crusoe sails from the island in the capture ship and finally reaches England. Back home, Crusoe finds that most of his family members have died. He also learns that his plantation in Brazil has thrived during his absence. As a result, he is enormously wealthy. The older, mature Crusoe is gracious in his new status and generous towards his old friends and the remaining members of his family. There are, however, some more adventures in life for Crusoe and his friends as they travel the land route through Europe to Calais. In the end, Crusoe settles down, gets married, and has three children. Many years later he visits his old island and finds it has been settled. He promises to send the inhabitants more essential things from Brazil. On this note the story ends. 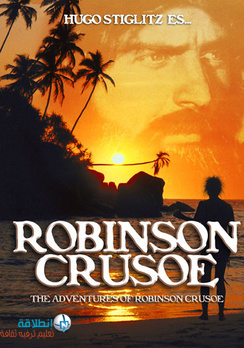 Robinson Crusoe: the main character of the story, he is a rebellious youth with an inexplicable need to travel. Because of this need, he brings misfortune on himself and is left to fend for himself in a primitive land. The novel essentially chronicles his mental and spiritual development as a result of his isolation. He is a contradictory character; at the same time he is practical ingenuity and immature decisiveness. Xury: a friend/servant of Crusoe's, he also escapes from the Moors. A simple youth who is dedicated to Crusoe, he is admirable for his willingness to stand by the narrator. However, he does not think for himself. Friday: another friend/servant of Crusoe's, he spends a number of years on the island with the main character, who saves him from cannibalistic death. Friday is basically Crusoe's protege, a living example of religious justification of the slavery relationship between the two men. His eagerness to be redone in the European image is supposed to convey that this image is indeed the right one. Crusoe's father: although he appears only briefly in the beginning, he embodies the theme of the merits of Protestant, middle-class living. It is his teachings from which Crusoe is running, with poor success. Crusoe's mother: one of the few female figures, she fully supports her husband and will not let Crusoe go on a voyage. Moorish patron: Crusoe's slave master, he allows for a role reversal of white men as slaves. He apparently is not too swift, however, in that he basically hands Crusoe an escape opportunity. Portuguese sea captain: one of the kindest figures in the book, he is an honest man who embodies all the Christian ideals. Everyone is supposed to admire him for his extreme generosity to the narrator. He almost takes the place of Crusoe's father. Spaniard: one of the prisoners saved by Crusoe, it is interesting to note that he is treated with much more respect in Crusoe's mind than any of the colored peoples with whom Crusoe is in contact. Captured sea captain: he is an ideal soldier, the intersection between civilized European and savage white man. Crusoe's support of his fight reveals that the narrator no longer has purely religious motivations. Widow: she is goodness personified, and keeps Crusoe's money safe for him. She is in some way a foil to his mother, who does not support him at all. Savages: the cannibals from across the way, they represent the threat to Crusoe's religious and moral convictions, as well as his safety. He must conquer them before returning to his own world. Negroes: they help Xury and Crusoe when they land on their island, and exist in stark contrast to the savages. Crusoe’s arrival on the island does not make him revert to a brute existence controlled by animal instincts, and, unlike animals, he remains conscious of himself at all times. Indeed, his island existence actually deepens his self-awareness as he withdraws from the external social world and turns inward. The idea that the individual must keep a careful reckoning of the state of his own soul is a key point in the Presbyterian doctrine that Defoe took seriously all his life. We see that in his normal day-to-day activities, Crusoe keeps accounts of himself enthusiastically and in various ways. For example, it is significant that Crusoe’s makeshift calendar does not simply mark the passing of days, but instead more egocentrically marks the days he has spent on the island: it is about him, a sort of self-conscious or autobiographical calendar with him at its center. Similarly, Crusoe obsessively keeps a journal to record his daily activities, even when they amount to nothing more than finding a few pieces of wood on the beach or waiting inside while it rains. Crusoe feels the importance of staying aware of his situation at all times. We can also sense Crusoe’s impulse toward self-awareness in the fact that he teaches his parrot to say the words, “Poor Robin Crusoe. . . . Where have you been?” This sort of self-examining thought is natural for anyone alone on a desert island, but it is given a strange intensity when we recall that Crusoe has spent months teaching the bird to say it back to him. Crusoe teaches nature itself to voice his own self-awareness. Crusoe is a careful note-taker whenever numbers and quantities are involved. He does not simply tell us that his hedge encloses a large space, but informs us with a surveyor’s precision that the space is “150 yards in length, and 100 yards in breadth.” He tells us not simply that he spends a long time making his canoe in Chapter XVI, but that it takes precisely twenty days to fell the tree and fourteen to remove the branches. It is not just an immense tree, but is “five foot ten inches in diameter at the lower part . . . and four foot eleven inches diameter at the end of twenty-two foot.” Furthermore, time is measured with similar exactitude, as Crusoe’s journal shows. We may often wonder why Crusoe feels it useful to record that it did not rain on December 26, but for him the necessity of counting out each day is never questioned. All these examples of counting and measuring underscore Crusoe’s practical, businesslike character and his hands-on approach to life. But Defoe sometimes hints at the futility of Crusoe’s measuring—as when the carefully measured canoe cannot reach water or when his obsessively kept calendar is thrown off by a day of oversleeping. Defoe may be subtly poking fun at the urge to quantify, showing us that, in the end, everything Crusoe counts never really adds up to much and does not save him from isolation. Crusoe’s encounters with water in the novel are often associated not simply with hardship, but with a kind of symbolic ordeal, or test of character. First, the storm off the coast of Yarmouth frightens Crusoe’s friend away from a life at sea, but does not deter Crusoe. Then, in his first trading voyage, he proves himself a capable merchant, and in his second one, he shows he is able to survive enslavement. His escape from his Moorish master and his successful encounter with the Africans both occur at sea. Most significantly, Crusoe survives his shipwreck after a lengthy immersion in water. But the sea remains a source of danger and fear even later, when the cannibals arrive in canoes. The Spanish shipwreck reminds Crusoe of the destructive power of water and of his own good fortune in surviving it. All the life-testing water imagery in the novel has subtle associations with the rite of baptism, by which Christians prove their faith and enter a new life saved by Christ. روبنسون كروزو رواية من تأليف Daniel Defoeدانيال ديفو,نشرت لأول مرة1719 تعتبر بعض الأحيان الرواية الأولى في الانكليزية. إن هذه الرواية هي سيرة ذاتية تخيلية .. (منبوذ إنكليزي يقضي 28 سنة في جزيرة بعيدة يصادف الهمج و الأسرى و الثوار قبل أن يُنقذ . هذه التقنية تعرف باسم الوثيقة الخاطئة و تعطي شكلاً واقعياً للقصة. يغادر كروزو إنكلترا في رحلة بحرية في أيلول عام1651 مخالفاً رغبات والديه.تسطو القراصنة Salèعلى السفينة و يصبح كروزو عبداً للمغاربة the slave of a Moor .يتمكن كروزو الهرب في زورق و يصادق قائد سفينة برتغالية مِنْ الساحلِ الغربيِ لأفريقيا.كان طريق السفينة إلى البرازيل حيث هناك بمساعدة من الكابتن يصبح كروزو مالك لمزرعة. ينضم كروزو إلى بعثة لجلب العبيد من أفريقيا , لكنة غرق في عاصفة تبعد أربعون ميلاً في البحر على مدخل نهر Orinoco (أورانوكو) في 30 أيلول عام 1659. يموت جميع رفاق كروزو و يتمكن هو من جلب الأسلحة و الأدوات و التجهيزات الأخرى من السفينة قبل أن تتحطم و تغرق . يقوم في بناء سور في مسكن و كهف , يصنع رزنامة بواسطة صنع علامات بواسطة قطعة خشب . يقوم بالصيد و يزرع الذرة و يتعلم صناعة الفخار و يربي الماعز .. يقرأ الإنجيل و يصبح متديناً فجأة و يشكر الله على مصيره فلا شيء قد فقد منه إلا المجتمع. يكتشف كروزو cannibals آكلي لحوم بشر يقومون بزيارة الجزيرة ليقتلوا و يأكلوا السجناء , في بادئ الأمر يخطط لقتل the savages الهمج لفظاعتهم لكن يدرك أن ليس لديه الحق لعمل هذا cannibals لم يهاجموه و لم يرتكبوا جريمة بمعرفته . يحلم كروزو بأسر واحد أو أثنين من الخدم بتحرير بعض السجناء وفي الحقيقة، عندما استطاع سجين هُرُوب، يساعد كروزو، يَسمّي رفيقَه الجديد.َ"جمعةَ Friday" بعد يومِ الأسبوع الذيِ ظهر فيهَ، ويُعلّمُه إنجليزية ويُحوّلُه إلى المسيحيةِ. تصل مجموعة جديدة من السكان الأصليين و يشاركون في وليمة مريعة و يستطيع جمعة و كروزو قتل معظمهم و الاحتفاظ باثنان منهم ( واحد هو والد جمعة و الثاني اسباني) يخبر الاسباني كروزو أن مجموعة من الأسبان الذين غرقوا موجودون على هذه الجزيرة. تبتكر خطة حيث يعود الاسباني و والد جمعة و البقية إلى الجزيرة حيث يبنون سفينة ليبحروا بها إلى ميناء اسبانيا. قبل أَن يَعود الأسبان، تظهر سفينة إنجليزية؛ و يسيطر الثوار على السفينة و ينووا هِجْر قائدِهم السابقِ على الجزيرةِ.القائد وCrusoe يَستطيعانِ العودة أخذ السفينةَ. و يَتوجّهونَ إلى إنجلترا، و قد تَرْكوا ورائهم ثلاثة مِنْ الثوارِ لاعتماد على أنفسهم وإعلام الأسبان الذي حَدث.يَتركُ Crusoe الجزيرة في 19كانون الأول 1686. يُسافرُ إلى البرتغال لإيجاد صديقه القديمِ، القائد، الذي يُخبرُه بأنّ مزرعتَه البرازيليةَ اهتمت بشكل حسن وقد أَصْبَحَ غنياً. مِنْ البرتغال، يُسافرُ براً إلى إنجلترا، لتَفادي الحوادث في البحر، عن طريق إسبانيا وفرنسا؛أثناء شتاءِ في Pyrenees، هو ورفاقه يَجِبُ أَنْ يَطْردوا هجومَ بالذئابِ الشريرةِ. يُقرّر كروزو بَيْع مزرعته، كعودة إلى البرازيل تَستلزمُ التَحويل إلى الكاثوليكيةِ. لاحقاً في حياة ما بعد الزواج، سَيكونُ عِندَهُ ثلاثة أطفالِ ويُصبح أرملاً، يَعُودُ إلى جزيرتِه لآخر مَرّة. يَنتهي الكتاب بتلميح حول تكملة التي تفصّلُ عودتَه إلى الجزيرةِ، التي كَانتْ قَدْ اكتشفت. Hi to еvery body, it's my first pay a quick visit of this web site; this web-site consists of awesome and really excellent data designed for visitors.